Club Penguin Cheats by Mimo777 Club Penguin Cheats by Mimo777: Gary has "Nothing To Report!" Gary replies to Rookie with a Club Penguin message! 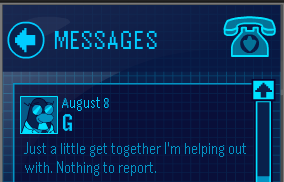 Really, G, NOTHING to report? Nice try, but we're not falling for that one! Hey Mimo I found a glitch! If you play your instrument at the lighthouse, then throw a snowball, It still makes the sound of your instrument, even though it's on the ground. i bet he is not, not telling us he just dosn't want rookie to know what hes up to because as we all know rookie can't keep any secrets. I don't trust G. He's acting odd. What if Gary has been kidnapped by Herbert and he's sending these messages! And what if he had crabs dressed up as G in the newspaper! And he put a speaker by his beak! That would explain why he looked nervous in the paper and why there was a crab in the background of the paper! Maybe Herbert's planned the party and he wants to ruin it for everyone or something like that! We must find out soon! I think G is planning the party so the penguins won't panic for the blackout. But G won't tell Rookie, who is an AGENT!